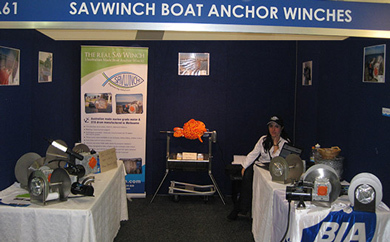 Savwinch launched their product range at the 2011 BIAV Melbourne Boat Show held at the Melbourne Exhibition and Convention Centre with outstanding success. Many boat show visitors including boating enthusiasts and marine industry experts visited the Savwinch stand where husband and wife team, Nick and Eleni were able to talk about the benefits and features of their Savwinch boat anchor winch products that have many advantages and are attractive in today’s market. People were pleased with the quality of the winch units, the Australian made components and most of all the competitive prices. We look forward to returning in 2012 with our successful Savwinch boat anchor winches and any new and exciting additions and modifications we may make to our product range.